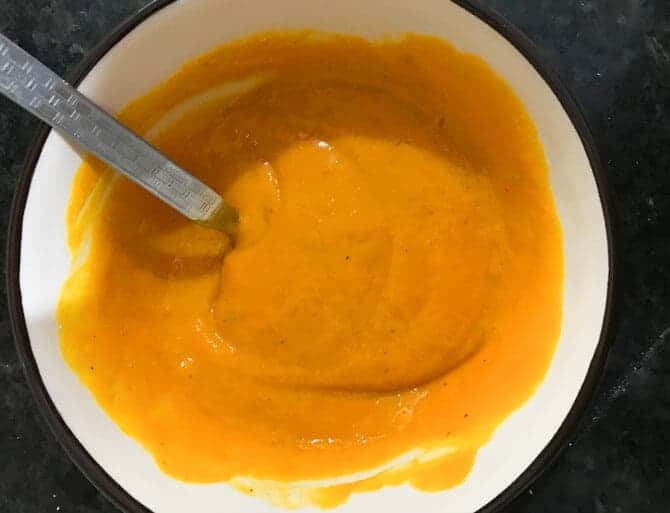 Easy Aamras Recipe with step by step photos. Aamras (Mango ras/ mango pulp) is popular mango sweet or dessert made from pureed mangoes. It is popular in the western belt of India across Gujarat, Maharashtra and Rajasthan. It is either served plain or flavoured with cardamom or dry ginger and sometimes saffron. 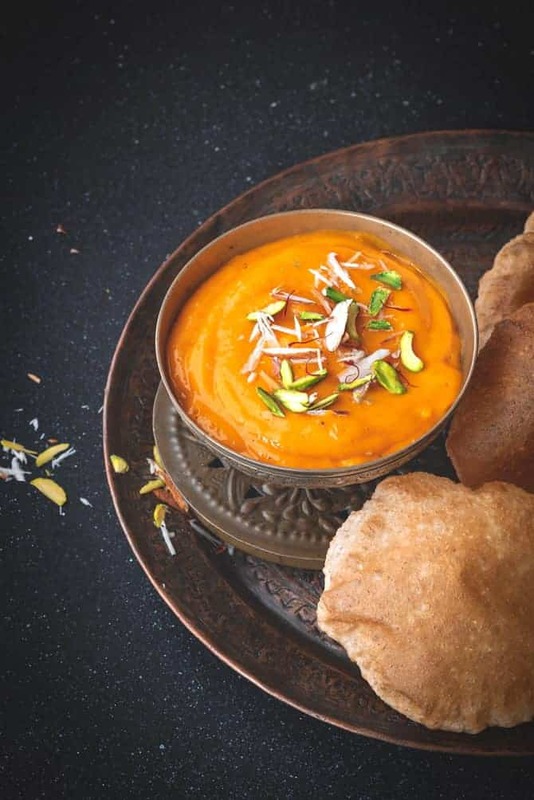 Gujarati aamras recipe makes the use of dry ginger powder and it is topped with some ghee, whereas in Maharashtrian recipe you will find cardamom powder added to it. Furthermore, Rajasthani recipe calls for addition of few saffron strands. Be it a cardamom or sonth or saffron, whatever the spice we add to it, aamras puri will always win the hearts. Aam means ‘mango’ and Ras means ‘juice or pulp’. Mango ras is basically a ripe mango pulp traditionally extracted using hands. 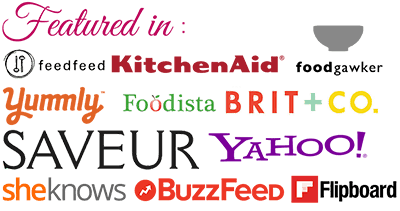 Now a days, mixers and blenders are available so, it is just the matter fo few minutes. 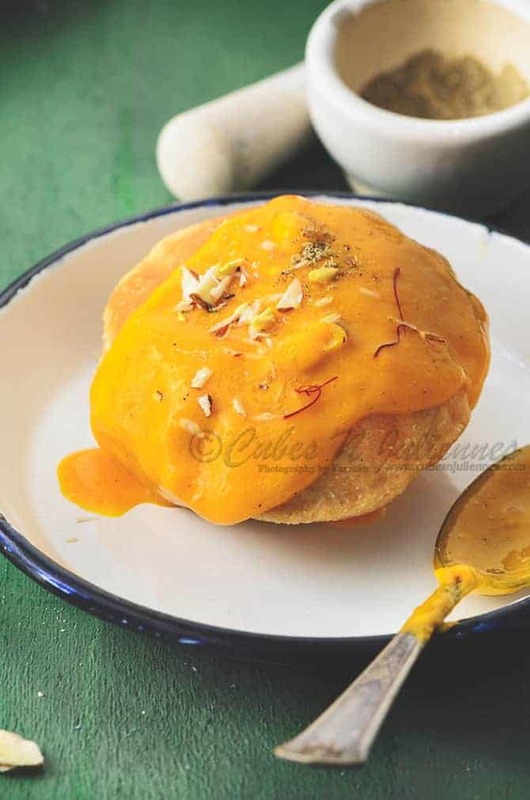 The name ‘aamras puri’ itself says that, the dish is traditionally served with hot fluffed pooris. But, in the other regions, people pair it with rotis and even steamed rice as well. 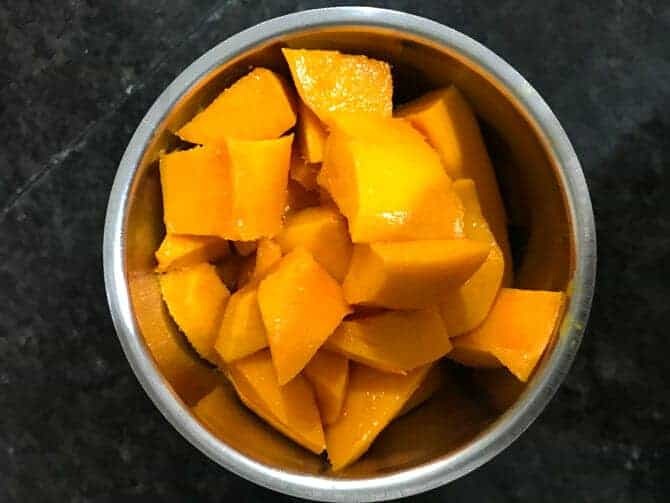 When we talk about the quality mangoes here for this recipe, I would highly recommend to use good variety of ripe Alphonso mango (hapus). However, other sweet variety mangoes like Kesar mango, Pairi, Dashari, Raspuri mango also goes very well. Adding sweeteners like sugar jaggery or honey is totally optional. If the mangoes are very sweet, then there is no need to add any sweetners to it. How to make aamras with hands (without mixer or blender)? Traditionally, in olden days, the mango pulp extraction was done using hands. Even today, in villages, the process of aamras puri is done by using hands. Believe me, that taste of flavoured mango puree is simply unmatchable. To make Gujarati recipe without using hands is absolutely easy. This recipe here I have shared is mixer/ blender recipe. Please refer below to instructions. If you prefer it to be more sweeter, then add sugar or jaggery as per your taste. Lastly, garnish with some almonds or pistachios, if you wish to. Serve it with hot fluffy puris. Can we make aamras using mango pulp (canned)? Yes, we can use canned mango pulp as well to make this recipe. And the most delightful part is you can enjoy it any time of the year to make mago ras. Also, even the fresh mango pulp can be used for this recipe. 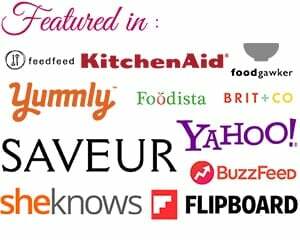 How to make the mango pulp with hands is mentioned above. Or simply just blend the mango cubes in a mixer and you have the mango pulp ready. How to make Gujarati Aamras Recipe (keri no ras)? Usually, the recipe is all the same every where across India. The only difference you will find here is, Gujarati recipe makes a use of some dry ginger powder which known as sonth (saunth). Furthermore, it do not make a use of milk. So, basically Gujarati recipe is without milk. It is just the plain pulp along with a pinch of sonth and some water ( if needed to loosen the puree). Lastly top it with some ghee (clarified butter) and serve with hot pooris. 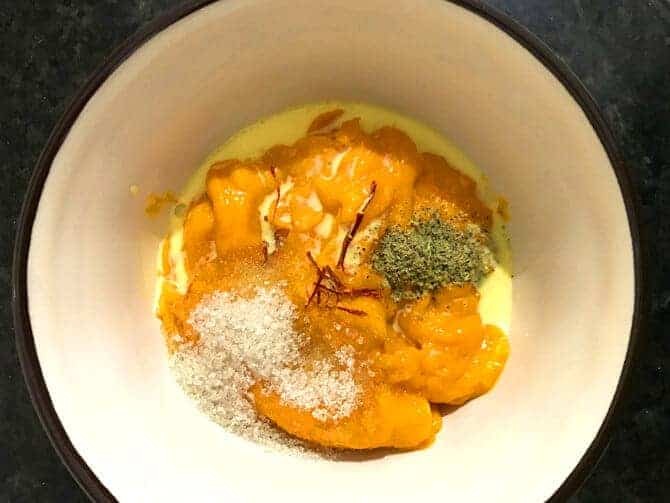 Can we make aamras recipe using frozen mangoes? Yes, we can use frozen mango cubes to make mango ras. All you need to do is just pop out the required quantity of frozen mango cubes. In fact, I shall share the secret to you here. Every year, without fail, i freeze the cubes of best quality mangoes(preferably alphonso mango aka Ratnagiri Hapus). Whenever, we want to indulge in any mango recipes, they are at the table frequently. Do you want to freeze them? So here is how to store mangoes in a freezer. Wash the mangoes and dip them in water for 2-3 hours. Now, with the help of fingers press the mangoes gently to loosen the pulp. Take off the tip and squeeze out the pulp in a clean bowl, discard the seed. Next, after squeezing them, peel it and extract the pulp completely. After this, if you find any pulpy lump, just take the whisker or wooden whisker (mathani) and whisk it well. Now add cardamom powder saffron milk, sugar and mix well. First, wash peel and cube the mangoes. Transfer it to a bowl, add cardomom powder saffron milk and sugar (if needed) and mix well. Chill for couple of hours. 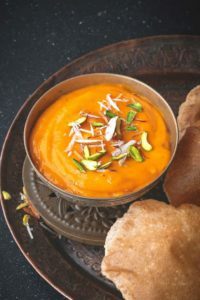 Garnish with slivered almonds and pistachios, and serve it with hot puris. 1. Wash, peel and cut the mangoes into cubes. Then, tranfer it to a mixer or blender annd blend it to a pulp. 2. Once the pulp is ready, transfer it to bowl and add, saffron milk, sugar and cardamom powder, mix well. 3. Gujarati Aamras is ready to serve. Before serving, chill for an hour and then serve with some hot fluffy pooris.